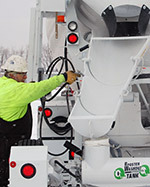 Operating the Booster Washout Tank® system is a straight-forward task. Clean as much concrete off the chute as possible before moving away from the discharge point. Many pollution control agencies allow for the dumping of plastic concrete on the job site. Make sure that you check with your local organization before dumping. 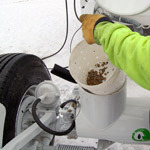 Ensure the Aggregate Bucket is securely placed in the top of the Booster Washout Tank®. 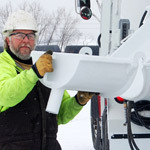 Attach the capped end chute and position its vertical drain over the 13 gallon Booster Washout Tank® mounted between the arms of the booster axle. Wash the hopper and chutes into the tank. After the chute(s) are completely rinsed off, the end chute should be stored away for transit. If all five chutes need to be rinsed, the last three will extend beyond the washout tank. The driver will need to simply wash out into a five gallon bucket and manually dump it into the tank at ground level. Activate the booster to carry the tank up to the charging hopper. A simple hand cable releases a hose allowing gravity to drain the tank into the drum. With the booster in the upright, "in transit" position, the driver is done and can return to plant. Check out our Video Page to see the Booster Washout Tank® in operation.